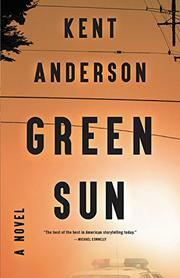 The Writer in The Gutter : Kent Anderson's GREEN SUN receives rave reviews! Make sure you do not miss this work! Kent Anderson's GREEN SUN receives rave reviews! Make sure you do not miss this work! Hanson, Anderson’s endlessly conflicted cop hero, leaves Portland (Night Dogs, 1996) for Oakland. It’s a marriage made in hell. It’s no surprise that most of his fellow officers take against Hanson, who doesn’t so much color outside the lines as operate on a frequency where the lines don’t appear. Lt. Garber tries to get him to drop out of the police academy because he’s too old, too set in his ways, and too noncompliant. The more practically minded Sgt. Jackson uses him as a crash-test dummy in training exercises. Officers Barnes and Durham use him to set up a suspect they’re after in full knowledge that they’re setting him up, too. Hanson, who thinks of himself as a social worker with a gun, never fights back, but he often zones out in the manner of a Kurt Vonnegut hero. As the months go by, he befriends Weegee, a street-smart kid; he quietly lusts after Racine, who’s called the cops on her abusive live-in; he keeps crossing swords with drug lord Felix Maxwell, though, in the manner of Kabuki warriors, neither of them ever seems to land a blow; he sees a vision of a black rabbit at the Mormon Temple; he responds to any number of complaints by defusing the situation and reporting that there’s nothing to report. Nearly half of Hanson’s violent, poetically rendered rookie year in Oakland has passed before some, though by no means all, of these plotlines begin to converge, and when they do, it’s like watching a finely crafted short story emerge from a novel-length chrysalis. Read Anderson for great scenes and an appealingly contrary hero, and the absence of the traditional kinds of genre coherence, not to mention suspense, won’t bother you a bit. Feb 2018. 352 p. Little, Brown/Mulholland, hardcover, $27. (9780316466806). e-book, $13.99. (9780316466820). Anderson doesn’t publish much, but when he does, it’s something to remember. This is his third novel about Officer Hanson, whose life pretty much parallels the author’s own: a tour in Vietnam (Sympathy for the Devil, 1987), followed by work as a patrol cop with the Portland, Oregon, police department (Night Dogs, 1996), a stint as an English professor, and then a return to policing, this time with the Oakland PD in the crack-ridden 1980s. Anderson picks up the story in Oakland, where Hanson is riding solo through the city’s meanest streets, earning grudging respect from the largely African American residents for his refusal to behave like every other cop and alienating his fellow officers for the same reason. The novel’s episodic structure follows Hanson on his beat, and in the accretion of incidents, Anderson shows just how hard it is to be a good cop, to put mediation before violence, to solve disputes rather than setting a flame to them. From night to night, four figures keep popping up, like themes in a fugue: a bike-riding teen called Weegee; his aunt, Libya, to whom Hanson is attracted; a drug kingpin who befriends Hanson and tries to hire him; and a black rabbit that may be real and may not. All four come together in a wrenching finale that functions almost cathartically for both Hanson and the reader, a release from the emotional tension that has been building throughout the story. It is perhaps the perfect time for an honest, realistic, unflinching portrayal of a good cop, and Anderson delivers just that.